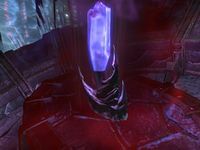 Destroy a powerful soul gem to disrupt Molag Bal's research. I met a Dark Elf named Dralnas who claims that Dremora have taken his soul to feed to something he calls the Anguish Gem. When you enter the Wailing Maw, you can find a frantic Dralnas Moryon at the entrance, talk to him to see what is wrong. "My soul! They've taken my soul!" "They took our souls. They fed them to some sort of Anguish Gem and now I'm the only one left. Can you destroy the gem before I wind up like the rest of these wretches?" "The Anguish Gem is just beyond this door, but it's barred from the other side. You need to go all the way around." As he said, you will have to travel the long way around to reach the Anguish Gem. Fight you way through various Dremora (Dremora Beldakyn,Caitiff,Ferylkyn, Harstryl), and Frost Atronachs until you reach a tunnel which branches in two directions, take path which has a steady incline. This will bring you to the natural platform which holds the Anguish Gem, kill the few Dremora guards and then destroy the Gem. You can then jump down into the cavern below, optionally killing Marwoleath before leaving through the side door. Talk to to Dralnas again, he will have noticed a change. "You destroyed the Anguish Gem, didn't you? I feel different somehow." "You did? I knew it! That's wonderful! I can't thank you enough. Now I won't wind up like the rest of these poor wretches. I have my soul back and I'm getting out of here!" You will receive a small amount of gold and a pair of Morrowind Vambraces. Dralnas asked me to destroy the Anguish Gem before it consumes his soul. The gem should be somewhere deeper within the cave complex. Finishes quest I destroyed the Anguish Gem. Now I should return to Dralnas Moryon and let him know.